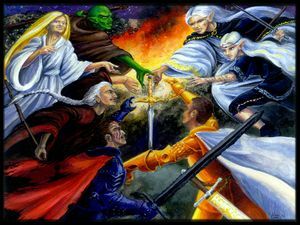 The major NPC participants of the Griffin Sword Saga, depicted counterclockwise from the top: Morvule, Eryael, Draezir, Zerroth, Kendryth, Chaeye, and Ulstram. Rendered by HATESHI. The Griffin Sword itself is a powerful tool gifted to Lorminstra, to be wielded by her champion, Morfell. The four priests of the Dark Alliance, however, convinced Morfell to give them the sword in exchange for prestige and power, hence, beginning the first part of the Griffin Sword Saga, often called the Griffin Sword War. When Morfell handed the sword over to the Dark Alliance, the sword split itself into four parts -- one for each of the High Priests. Each of the high priests were defeated, in time, and the four shards of the sword were recovered. The sword was reassembled, placed within a stone, and would impart blesses to those who would rub the stone until it was destroyed again, in the second Griffin Sword War. The Griffin Sword was to be Purified by a Prophet of Lorminstra and his guard, named Ulstram and Kendryth, respectively. During the purification process, the four priests of the Dark Alliance returned to claim the sword given to them by Morfell. The High Priest, Morvule Thinevael, delivered an ultimatum to return the sword, or the they would lay waste to the town of Wehnimer's Landing. Ulstram responded by drawing the sword from the stone and attacking Morvule with it. Durring the battle, the sword shattered, spreading itself across the world, beginning the second Griffin Sword War. The shards were found individually in various locations throughout Elanthia. The first shard, the hilt, was found by Siwas Devessi on the Isle of Teras. The second shard, the quillions, was found by Alisaire Frey in Solhaven. The third shard, the pommel, was found by Maimara Andriatti in the catacombs of Ta'Illistim. The last shard, the blade, was found by a merchant who attempted to sell it to the highest bidder before Ulstram imprisoned him within his own mansion, disallowing him from profiting from the blade. Eventually Ulstram received the blade and battled Zerroth, Eryael, Draezir, and Morvule. Morvule possessed the other three shards, and crafted a blade to combat Ulstram. Eventually, Ulstram struck Morvule down... but Morvule returned and slayed Ulstram, and the other three high priests were found to be in good health. The Dark Alliance recovered all four pieces and worked to finish it. Morfell was to wield the blade as he was originally intended to, but the priests had to remove any "taint" that Morfell might possess. Eventually, Charna Ja'Varrel'Kav was given a sickle by the Triad of Gosaena. Armed with a powerful sickle, confronted Morfell after the process was completed. When Morfell attacked Charna with the Griffin Sword, the blades contacted, destroying the sword and causing the sickle to age rapidly. The sickle lost its powers, but the sword was gone forever. Pages in category "Griffin Sword Saga"
This page was last modified on 9 June 2017, at 16:46.